I absolutely love biographical movies like Can You Ever Forgive Me? because you get a true insight into the lives of real people who have had an impact on society. The movie is due in theaters on October 19th, 2018 and showcases the true story of Lee Israel (played by Melissa McCarthy), a best-selling author/biographer-turned-literary forger. However, while you’re waiting for the movie to hit theaters, here are some other awesome biographical movies that are based on the lives and careers of writers. 100+ Amazing Movies Like the One You Just Watched (Plus Free PDF)If you enjoy watching biographical movies as much as I do, you’re going to love them! Movies Like Can You Ever Forgive Me? Before Night Falls is a 2000 biographical, drama, romance movie that is based on the 1992 autobiography of Reinaldo Arenas , a novelist, playwright and poet best known for his set of works called Pentagonia, which talks about post-revolutionary Cuba. The movie showcases Arenas’ early years growing up in Cuba, the time he spent in prison and his 1980 escape to the U.S. Javier Bardem stars as Reinaldo Arenas. It’s a great movie for those who want to learn a bit more about what life was really like in Cuba, especially for the LGBT community. Like the majority of biopic movies, this one did well with critics. It scored a solid 73% on Rotten Tomatoes and 7.3 on IMDB, meaning both critics and the average viewer equally enjoyed it. American Splendor is a 2003 biographical, comedy, drama movie that centers on the life of Harvey Pekar, author of the comic book series of the same name. The movie not only describes the life of Pekar, as a comic book writer, but also as a media personality and music critic. Paul Giamatti stars as Harvey Pekar. I am not a huge comic book fan, but I am a huge Paul Giamatti fan. If you haven’t seen the 2005 movie- Cinderella Man- I highly recommend it. Giamatti plays the role of Joe Gould and does an absolutely outstanding job. Sylvia is a 2003 biographical drama movie that focuses on the romance between Sylvia Plath, a novelist, poet and short story writer and Ted Hughes, a children’s book writer and poet. The movie describes their romance, from the first meeting at Cambridge University in 1956, until Plath’s suicide in 1963. Plath struggled with depression for most of her life. Gwyneth Paltrow stars as Sylvia Plath, while Daniel Craig stars as Ted Hughes. While IMDB reviewers liked this one enough to give it an above-average score of 6.3/10, Rotten Tomato critics were a bit harsh, scoring it a measly 37%. Capote is a 2005 biographical, crime, drama movie that centers on Truman Capote, an actor, novelist, playwright, screenwriter and short story writer. The movie focuses on the time period that Capote was writing his 1966 book- In Cold Blood. It details the 1959 quadruple murders of the Clutter family in a small farming community in Kansas. The late Philip Seymour Hoffman plays the role of Truman Capote, which he won an Academy Award for Best Actor. This is one of my absolute all-time favorite movies. I swear I must have seen this movie at least 7 times. It is just amazing the dedication that Capote had when he was researching the murders for his book, as well as the strange (or maybe odd is a better word) relationship he had with one of the killers. And, of course, Philip Seymour Hoffman totally nailed his portrayal of Capote. This is another highly rated movie, earning a 94% on RT and a 7.4/10 on IMDB. Miss Potter is a 2006 biographical drama movie that depicts the life of Beatrix Potter, a conservationist, illustrator, natural scientist and writer, mostly children’s books. The movie showcases Potter’s lifelong struggle for happiness, love and success. Renee Zellweger stars as Beatrix Potter. One of Potter’s most successful books was the 1902– The Tale of Peter Rabbit . I can remember my grandmother reading that book to me back when I was just a kid. Surprisingly, this one only scored a slightly above average 66% on RT. IMDB users liked it a bit better, giving it a solid 7/10. Eat, Pray, Love is a 2010 biographical, comedy, drama, romance movie that is based on the 2006 best-selling memoir by Elizabeth Gilbert, an author, biographer, essayist, memoirist, novelist and short story writer. The movie focuses on Gilbert’s journey of self-discovery, around the world, after her divorce. Along the way, she enjoys Italy’s cuisine (Eat), discovers India’s spirituality (Pray) and finds her true love in Indonesia (Love). Julia Roberts plays the role of Elizabeth Gilbert. (I love Julia Roberts as an actress. She has been in so many amazing movies, like Steel Magnolias, Pretty Woman, Erin Brockovich and August: Osage County). The reviews for this one are a bit strange. Just about everyone I know LOVED the movie, but RT only gave it a 36%, and IMDB a 5.7/10. Wild is a 2014 biographical, adventure, drama movie that is based on the 2012 memoir- Wild: From Lost to Found on the Pacific Crest Trail- by Cheryl Strayed, an essayist, memoirist, novelist and podcast host. After her divorce, Strayed embarks on a journey of healing and self-discovery. This journey took her on a 1,100-mile solo hike through the Pacific Crest Trail. Reese Witherspoon stars as Cheryl Strayed. Side note- Is it me or does it seem like writers embark on journeys of self-discovery a lot? I think it is a great thing to do. Anyways, what I really wanted to mention is that Reese Witherspoon is my FAVORITE actress ever. I love the majority of her movies, so it’s almost impossible for me to pick a favorite one. But, my favorite ones are: Cruel Intentions , Legally Blonde , Walk the Line , Hot Pursuit , Water for Elephants and Sweet Home Alabama . Told you it was hard to pick just one!! Looks like I’m not the only one who loved this movie! RT gave it an 89%. IMDB people only gave it a 7.1/10, but that’s still pretty good! The movie focuses on the 5-day interview/road trip of David Lipsky, a journalist, novelist and short story writer and David Foster Wallace, a writer and university professor. Jesse Eisenberg stars as David Lipsky and Jason Segel stars as David Foster Wallace. I loved Segel in How I Met Your Mother , so I usually try to check out his movies. The End of the Tour is another one that Rotten Tomato critics loved, giving it a 91%. IMDB viewers scored it a 7.3/10. Trumbo is a 2015 biographical drama movie that is based on the 1977 biography- Dalton Trumbo- by Bruce Alexander Cook. The movie centers on the life of Dalton Trumbo, a novelist and screenwriter. Bryan Cranston plays the role of Dalton Trumbo. I think everyone needs to add this movie to their must-watch movie list. This one scored a 7.5/10 on IMDB and a 73% on RT. The Glass Castle is a 2017 biographical drama movie that is based on the 2005 memoir by Jeanette Walls. The movie focuses on the early years of Jeanette Walls, an author, columnist and journalist; more specifically, her poverty-stricken, unconventional childhood. Brie Larson stars as Jeanette Walls. While IMDB reviewers liked this one enough to give it a 7.2/10, RT wasn’t so kind. It only scored a 50% with their critics. 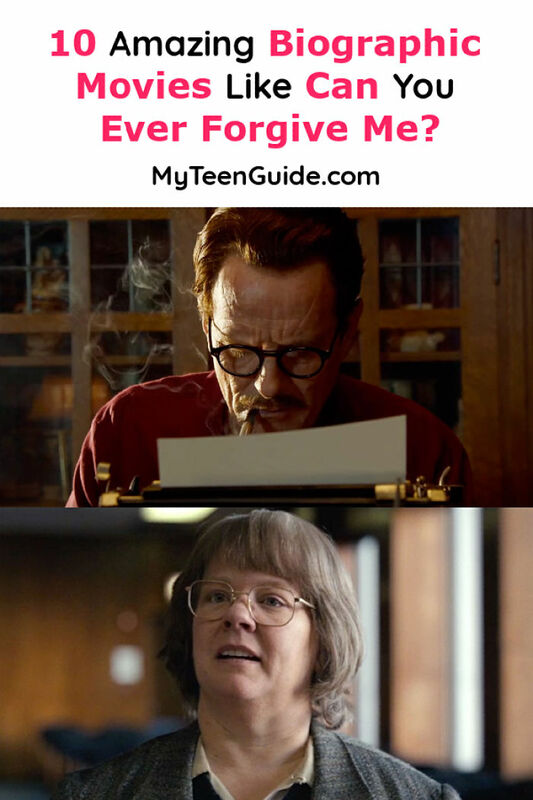 There are actually quite a few amazing biographic movies like Can You Ever Forgive Me?, so it was hard to narrow down the list. It really just depends on what type of biography you want to watch! These are my top picks that span just about every sub-genre, from music biography movies like A Star is Born to literary bios, like Miss Potter. Do you have any other favorite biopic movies like Can You Ever Forgive Me? Share below!